I've been homeschooling for seven years now, over the course of which I've heard about and viewed a variety of curricula. Five in a Row is a curriculum I've heard of often but have never actually held in my hands. The name is based on the concept of reading one picture book five times in a row over five days, carrying the content into various other subjects as a unit study. I'm not much of a unit study person. Similar to my preference that different foods do not touch on my dinner plate, I prefer distinct division of academic subjects. Unit studies are more like casseroles, just as nutritious, but a mingling of the food groups. Sticking to comfortable styles, I never got around to expanding my academic palette. Now that my children are ages 9 and 12, I figured it was too late to even consider. If there were something to use beyond picture books, perhaps..
Much to my surprise, I discovered that Five in a Row (FIAR) has curriculum for a broad range of ages, from toddler through high school. How did this get by me, a self-proclaimed Curricula Queen? For review I received Beyond Five in a Row, Volume 2 for ages 8-12, written by Becky Jane Lambert, homeschool graduate and daughter of Five in a Row curriculum author Jane Claire Lambert. As the name indicates, the program is for kids who have moved beyond reading picture books and uses chapter books as a foundation instead. Have no fear...there will be no reading a chapter book five days consecutively. However, the original flavor of the earlier concept is preserved, using literature as the springboard to a love of learning in all areas. Volume 2 explores four titles total, two fiction and two non-fiction. Titles included are: Sarah, Plain and Tall, The Story of George Washington Carver, Skylark, and Helen Keller. Unlike the FIAR series, which covers specific academic subjects on specific days, Beyond FIAR bases weekly activities on individual chapters. Subject emphasis, activities and time needed will vary depending on the information presented in each chapter of the book. Overall, it will take two days or so to complete the activities for each chapter and one semester to complete the entire volume. However, there is no set schedule and students are encouraged to study where their interests lead, savoring each educational bite, rather than rush through. Five principal academic areas are covered: History and Geography, Language Arts, Science, Fine Arts and Human Relationships. Throughout the volume are also special learning opportunities that include topics such as drama, internet, career path, art, cooking and essay questions. The author is clear that supplementation will be needed in arithmetic and specific language arts areas such as grammar, spelling and penmanship. Language Arts: Letter Writing – P.S. and R.S.V.P. For each activity listed, the teaching parent is provided with anywhere from a paragraph to a full page of explanation, information and ideas on how to approach the topic with the student. The activities are flexible enough to allow adjustment for varying abilities. In the back of the book is a complete list of the scope of topics covered throughout the entire volume, especially helpful to see the academic ingredients to the unit study casserole for those of us who need it. Even though I'm not a unit study person, Beyond Five in a Row could easily fit into our homeschool as a supplemental resource. I found its flexible and gentle approach quite palatable and I now wish I had explored the Five in a Row series when my children were younger. Sarah, Plain and Tall was already on my son's reading list for the year. What a great supplement to spice up our current program and to further enhance understanding, bring in more interest, or inject a little fun. I especially liked the writing activities, which easily had enough substance for the older writer. Many of the writing activities included excellent and relevant discussion questions that could be done verbally as did the Issues of Human Relationships section. Beyond Five in a Row would also be an excellent resource for a book club or co-op situation where students can come together to discuss a selected book and do related activities, such an art project - or cooking. Of course, those who know and love Five in a Row will likely enjoy the continuation with Beyond as the meat and potatoes of their studies. Five in a Row has quite a following, over 50,000 per the webite, of families who enjoy learning at the leading of great literature. You will find a large and active message board community of users at the Five in a Row website with which to share the experience. Before Five in a Row, ages 2-4: Twenty-three FIAR-style mini-units based on simple children's books are included in this title to inspire learning readiness. Five in a Row, ages 4-8: There are 3 volumes, together covering 55 titles, of this step-by-step instructional guide using outstanding children's literature. Above and Beyond Five in a Row, ages 12 and up: This unit study is aimed directly at the student and designed to be completed as a 6-8 week study or over several months as a supplement. Five in a Row also has a number of supplement and digital products to go with the curriculum. You can view their menu of printed items here and browse available digital items here. Whether you are looking for some a la cart supplemental activities or would prefer a full course unit study, Five in a Row brings to the table a variety of selections for ravenous learners of all ages. Visit the TOS Crew's Official Blog to hear what other Crew members thought of this product. Story Contest - 3 Weeks Left to Enter! Grab your pencils and get those creative juices flowing! The Old Schoolhouse® Magazine is hosting our second Storytime Writing Contest! We have two creative fiction categories: adults (16 and up 2,500 words or less) and children (15 and below 1,500 words or less). Deadline to enter is March 16, 2009. $7.95 fee per entry. Grand prize winners in both the adult and child categories will receive prize packages valued at over $1,000, publication in the Summer 2009 issue of TOS, and publication in our Storytime 2009 Compilation E-Book. Eleven Honorable Mentions from each category will also be included in the E-Book in addition to receiving gifts from top homeschool companies. For a detailed list of prizes, official contest rules, to meet our judges, and to upload your story, please visit: www.TheHomeschoolMagazine.com/Short_Story_Contest.php. Need help teaching writing? We have over 200 writing products in the Schoolhouse Store! As an engineering major, I had plenty of required math courses. Math was not my favorite subject but I was usually capable with a little work. However, one semester I found myself in a predicament with a falling grade. I was one student of hundreds for the lecture portion of the class. In the smaller working session, I had difficulty even understanding the teaching assistant because of a thick accent, let alone the foreign material. Many of my classmates were just as lost. As I was grasping on to a C, I decided to hire a tutor. After a few sessions with the tutor, I earned an A on my next exam. No magic was to be found in the tutor. He just explained to me how to do the problems in a language I could understand, both literally and figuratively. The tutor took what seemed like a complicated problem and broke it down into steps. I felt like going to my instructor and asking, “Why are you making this so complicated?”. Have you or your student ever been in need of a good tutor to move you forward in a subject? 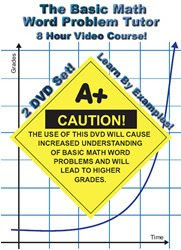 Jason Gibson, Math Tutor founder and teacher, started offering his DVD math courses at the request of the many satisfied students and friends he tutored. What started out as a small eBay venture soon turned into a full course line with thousands of happy customers. “ I pride myself on providing quality educational content at affordable prices, and I have a passion for making "complex" subjects easy to understand. " Not only does Gibson have the passion for teaching the subject, his educational and professional background is impressive, including his current employment with NASA as a fully certified space shuttle flight controller. When reading his credentials, there may be a worry that he may talk over the student's head. However, Jason Gibson knows that it takes to deliver his knowledge effectively to the student. It is important that the instructor and his approach be understood because of the simplicity of these courses. There are no bells and whistles, no amazing graphics, no cartoon characters doing dances or even a change of scenery. This courses are simply Gibson, a white board and math. The philosophy of Math Tutor is that the best way to learn is through examples. Each section of the course includes numerous fully-narrated example worked out step-by-step. I received two Math Tutor course for review, Basic Math Word Problems and Algebra 2. I have to admit, I was initially unimpressed upon my first viewing. As I said earlier, these DVDs are simply a casually-dressed Jason Gibson standing at a white board going through problem after problem. The presentation is rather drab and the tone is very conversational, with many an "um", "okay", and nervous gestures. Some may be bothered that fingers are used to illustrate simple math and may contradict your teaching, though I personally allow it in my home. In fact, when my son was younger he actually developed a rather complicated base-ten system using his fingers. However, the purpose of the course isn't to entertain nor for public speaking instruction, it is math. What is important is Jason Gibson's ease in explaining the math problems in the way that the student can understand. The lack of bells and whistles is an advantage because there is nothing to detract from the work at hand. Below you can view a sample video from the Algebra 2 course. You may view samples from other courses here. I had my 9-year-old son view some of the Basic Math Word Problem course. He said the course was very “plain” though explained well. This is something I would use in small doses with him as he had trouble keeping focused after the first couple examples. I'm not sure if that is a reflection of my son or his age. However, I can see this DVD course being a useful tool to have on hand when extra explanation or practice is needed. I'm not sure who was more surprised, my daughter or me. My daughter further explained. While I can typically explain my daughter's math, I'm probably not as thorough as the Math Tutor course. I actually learned a great deal about how to teach math better by watching them with my daughter. These courses are also tools that the student can use on their own, whenever they need a little extra help, encouraging independent learning. I will definitely be checking out more Math Tutor courses to put on our shelves. Math Tutor would be excellent for struggling students or teachers or just as an extra math resource in your home. Prices range from $21.99 - $49.99, with some courses containing as much as 14 hours of instruction. In our area, one-hour of math tutoring goes for over $50. If you are not completely satisfied with your Math Tutor course, there is a 30-day full refund guarantee. LIMITED TIME FREE BONUS: Each new Math Tutor DVD customer receives 60 minutes of FREE live online tutoring available 24/7 through Tutor.com! A $35.00 Value! Facebook users can also get a $10 off coupon good for any single DVD. Details here. I've found an unexpected gem in Math Tutor. Head over to their website to view all the different titles available. Read reviews of this product by other TOS Crew members here. When my son was younger, he had a difficult time learning the order of the days of the week. It was something we'd go over and over, looking at the calendar and reciting them in order. It just wasn't sticking. However, once the days were put to a tune, he remembered them always. It wasn't even a tune he knew previously (The Addams Family theme song), but it was catchy and it stuck. From that point on, he'd simply sing the song whenever he wanted to know the order of the days. Does music help long-term memory? How many of you actually mentally sing the ABC song when looking up a word in a dictionary or putting something in alphabetical order? I do! There are many (oh, so many...) things I've forgotten since my school days, but the ABC song is forever ingrained in my head. Music is a powerful thing! Bible StorySongs was inspired when two moms, now grandmas, were looking for something fresh and new for summer Bible camp lessons. They set stories and verses from the Bible to old-fashioned tunes, making them easier for the kids to remember. Bible StorySongs uses the power of music to teach the power of the Word! There are currently six double-length albums available, approximately one-hour long each. Accompanied by piano, the songs are sung by children, either solo or as a choir. Lyrics are included for children to learn and sing along, though I bet most kids will be able to do that just by listening! Sent them forth to heal disease. Two sons of Zebedee, James and John. This song and the other 32 songs on the CD can be sampled here. One of my first thoughts when listening to this CD was that is would be an excellent tool to reinforce Bible stories taught at church or home. Since the music is more calm rather than the get-up-and-dance variety, it would also be great for soothing background music in the church nursery or during down or play time for kids at home. I think younger kids would appreciate the songs the most. Both my nine and twelve-year-old felt it was too young for them and didn't fit their preference for more modern music. Individual titles start at $9.99 and are available for as low as $4.99 with bulk purchase. Also available are Color 'n Sing, e-books, Puzzle Pages e-books and sheet music that correlate with the CD. Visit Bible StorySongs to see what is available or to make a purchase. You can also buy one song or the entire album at major internet music retailers. See what others thought of various titles of Bible StorySongs by clicking here. A Review of Heads Up! In the past few years, I've noticed an influx of “accidental homeschoolers”. Accidental homeschoolers are those who did not intend to homeschool but turned to it because of a less than adequate, or even toxic, classroom situation. Homeschooling is thrust upon them, ready to be embraced for the benefit of their child. Many of these families have bright, wiggly, and sensory sensitive kids that don't thrive in a classroom with thirty other children. Sometimes learning disabilities are at play, disabilities that may hinder learning in the classroom but don't have to hinder at home. With the right information, tools, and support, these kids can move from struggling learners to joyous learners. "Our goal is to provide materials and information for homeschooling families, occupational therapists, speech therapists, teachers, and specialists who work with children who have developmental delays, learning disabilities, or other special needs. Professionals, as well as parents and families interacting with special needs children, need materials and teaching tips that will be effective in promoting successful learning experiences while reducing frustration for children, teachers, and parents." From the variety of products offered by Heads Up!, I received a selection of frames and readers in a variety of colors - Top of the Line, Double Time, Readers, and large and small frames . These products are used as vision aids, particularly for kids that are either distractible or dyslexic. The Top of the Line, Double Time, and Readers are all used to help readers keep focused on not lose their place. Top of the Line and Double Time, both 2 3/8” x 8”, come in blue and yellow. One line of text is viewable in the color area of Top of the Line and two lines for the Double Time. The Reader , 1 1/2” x 7”, views one line at a time between two strips of gray and comes in seven colors. The various colors help maintain focus on the reading material. All three of these items make great bookmarks too. The small (4" x 4 1/2") and large (4" x 9") frames are meant to highlight a particular area of the page where you want your child's attention directed. The smaller frames are especially helpful to highlight just one math problem on a page for the easily overwhelmed student. Both frames are useful tools for the drifter or easily distracted, who is prone to look out the window and forget where he/she left off when attention is returned to the page. My son has had tracking difficulty and other vision challenges while reading, such as pulling words from lines above or below. We even went the route of vision therapy for a time. There was improvement after the therapy, but some minor issues have remained. His eyes tire quickly, all small text is avoided and glare can be problematic. I heard of overlays possibly helping in these areas, but I had yet to give it a try since most of the issues were largely resolved. I showed my son the selection of frames and readers I received from Heads Up!. Within 15 seconds he knew without a doubt that blue was his preferred color, while the other colors were met with indifference. Using the Double-Time reader, he immediately started reading a book that had text that would have otherwise been too small for him to tolerate. Remembering to use the overlays doesn't always happen, but when he does it seems to help some. I may purchase more of the blue readers to use as bookmarks so they will be handy. Each frame and reader costs only $1 each, a small investment if your struggling reader wants to read more when using them. If you are curious on why color overlays may work for some kids, research Scotopic Sensitivity Syndrome and the Irlen Method. There are many reasons that could cause reading issues and I do encourage investigation to discover the source. When browsing through the Heads Up! catalog, I discovered I've picked up many of the products from various sources over the years. Heads Up! is a great single source supplier for products that you may not even know could help. I've accidentally discovered items that fit in with the learning styles and needs of both of my children. For example, I purchased an inflatable disk to use as balance practice. However, I soon found it on the seat of a chair, which allowed my kids movement while sitting. It wasn't the intention when I purchased the product, but my kids found a better use for it. Flipping through the catalog, I found this exact same product marketed for this use. Melinda Boring knows what works! While these products are marketed for kids with learning and attention struggles, my experience tells me that many work with most any child. While only one of my kids regularly needs help staying focused, both of my children use the products we own from the Heads Up! catalog. Some of the products we own and enjoy are: Time Timer, various fidget toys, Bookzup, therapy balls, Vocabulary Cartoons, Page Up, Mind Music, various pencil grips and more. 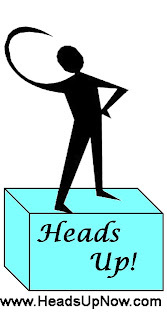 Visit the Heads Up! website and check out all the interesting products offered to assist you in homeschooling learners of all kinds. You can also visit Melinda's blog for personal stories on homeschooling, learning disabilities and life. Also, if you are in the area of the Midwest Homeschool Convention taking place in Cincinnati on April 16-18, Melinda Boring will be presenting workshops and will have a booth in the Exhibitor Hall. Visit the Official TOS Crew blog to read more reviews on this product. This was the response of my dad when I first told him of my intentions for his grandkids to study Latin. From my father's perspective, and many others, studying a dead language serves no purpose. Unless the initials M.D. are in the future, wouldn't Spanish or French be more practical? It depends on your goals. If you plan on moving to a Spanish speaking area, well then yes, Spanish would be they way to go. However, that isn't my goal. My primary goal is for better understanding of our OWN language, which has its roots in Latin. My daughter aspires to be a writer and enjoys creatively composing and playing with words on paper. Latin will help her expand her vocabulary and understand words better to further develop her writing style. Conversely, my son is not a writer and struggles with word structure and meaning. However, he is very analytical. If he can learn to dissect his own language, in a way that he would deconstruct a Lego structure, he will be better equipped to write and understand word meaning. I was thrilled to have the opportunity to review The Bridge to the Latin Road, Intro to Latin by Schola Publications. The Bridge to the Latin Road is the transition course between The Phonics Road to Reading and Spelling and The Latin Road. The Phonics Road is a complete language arts curricula for grades K-4 and The Latin Road is a 3-year Latin course for grades 5-12. The Bridge to the Latin Road, for grades 3-6, is designed to lay the framework the student needs for Latin study. Barbara Beers, author of all three programs, likens learning language to building a house. Once the foundation of basic spelling, writing and reading skills are laid, it is time to build upwards with the framework of the house. As a result, you will find Beers takes a very systematic approach for both the teacher and student. Each lesson is fully explained to the teacher on the six instructional DVDs. The DVDs also include Grammar Rule Tunes, used to help the student remember the components of English sentences. Barbara Beer goes over each work page, the objective of the lesson, and how to teach the material. The Teacher's Manual contains every page in the Student Package and as it should look when completed by the student. By the end of the course, the student will have an organized reference manual to use during The Latin Road to English Grammar course. The 36-week program is broken down into 4 days per week, with an assignment schedule for each day. For a full scope and sequence, click here. The course is structured with three main categories, Framing Codes, Sentences to Analyze, and Designing Codes. Each code has 5-10 pages of material to be completed, each building upon the previous. For example, the first page of the Sentences, Phrases, Clauses code defines a sentence and goes over the four sentence types. By the end of that particular code, students are diagramming, or scaffolding as Beer's terms it, relative clauses. Before the students are able to get to this point, they have also worked through the other codes at the same rate, slowly adding layers to their understanding for all the parts of speech. The Sentences to Analyze section contains the dictated sentences for the students to apply what they learned in the Framing Codes. At first, this involves writing the dictated sentence and circling, underlining or marking various parts of speech. In the later weeks, students will be able to fully diagram complete sentences. The Designing Codes is where the Latin is introduced in the form of prefixes, suffixes and base words. Designing Codes are first introduced in Week 11 after the basics of the parts of speech are covered. By the end of the program, the student will be able to use the Designing Cards to build approximately 400 words from Latin roots. My daughter has a strong language arts foundation, so she began her Latin studies this fall. My son, age 9, requested that he start this year too. I hesitantly allowed him to take a 10-week introductory course to comply with his request, but he simply isn't ready to go beyond Latin exposure. He does not have the foundation and framework established to move forward. I was excited to be able to try The Bridge to the Latin Road with him. He has strong reading skills, but writing skills are another issue. My focus has been to get him functional in writing before fully covering grammar. As a result, we've done very little grammar in exchange for spending a great deal of time in spelling with an Orton-Gillingham approach. Initially, flipping through the Teacher's Guide, the program looked overwhelming. With nearly 200 pages of written work through the course, I was wondering how my non-writing son would fair. Once I watched the first lesson on DVD and flipped through the book to better understand the organization, I was ready to get started. There are a couple references to the preceding program, The Phonics Road to Reading and Spelling, and pages completed during the program. I would have preferred to have a reference page, but it wasn't too much hassle to work around. Otherwise, the instructions for the teacher were clear. While there is a lot of writing for the student, I was surprised to not get too many complaints. I was sure to not do the program directly after other written work for other subjects. Most days my son was able to complete the assignment for the day, but a few times we split up the assignment. Since the schedule is based on a 4-day week, this did not cause a problem as far a keeping to the schedule. For the average 3-6th grader, the writing requirements would most likely would not be a problem. It should also be understood that the student pages are not worksheets, to be completed independently. The teacher guides the student, giving instructions and dictating words and sentences. While Latin prefixes, suffixes and base words are introduced, this is not a Latin program; it is a study of the English language. The Bridge to the Latin Road is simply that...a bridge. After completing this program, your student will be prepared to study Latin more formally. Even if your student has no desire to study Latin, this course is an excellent grammar study. What I appreciated most about this program was its thoroughness. The student is given adequate practice to apply new material before introducing more. The structure of the English language is slowly built from each framing code simultaneously. Even with very little grammar exposure, my son was able to move through the material with little trouble. If the student needs review, they are able to refer back to their own personally-created reference manual. I can't say this is an exciting and fun program that will have your student begging for more, but where it is going and what is being learned will be quite clear. You can't build a framework without having a clear picture of what the structure is to look like. There is no clutter of unnecessary graphics or colorful pages, just the tools needed to learn the information. This program simply gets the building done and leaves the student with the blueprints for future reference. The Bridge to the Latin Road sells as a complete package for $139.00. Visit Schola Publications to find out more about this program or the others mentioned, as well as to request a free sample packet. Curious about what others think about Schola Publication products? Visit the Official TOS Crew blog to find out more! Salem Ridge Press is offering a FREE download of the historical fiction novel Glaucia the Greek Slave by Emma Leslie. This is a title, along with two others from Salem Ridge Press, that I reviewed in November. You can read the full review here. To get your free download, click here. Enjoy! When I was first considering homeschooling, I had a ton of questions. I'm sure we've all heard them rolling out of inquiring mouths or even thought them ourselves at some point or another. Where do you buy curricula? How do you even know what to buy? How do you know you are teaching everything? The problem was, I didn't know a single solitary homeschooler to ask my questions. Not one. I asked around locally and turned to the internet. In my search, I discovered a local friend was also contemplating homeschooling and also found another local family online with the same quest for information. Together, we all joined a local group and met another family just starting out. Unfortunately, it was a very small support group that really had its focus on older kids and not a great fit for young families new to homeschooling. The families starting out fumbled together and eventually we formed a thriving support group of our own. However, what I really needed in those just starting out times was someone willing to take me under their wing, invite me out for coffee, and guide me through those scary, overwhelming thoughts about homeschooling my children. Terri Johnson of Knowledge Quest, a supplier of history and geography resources, is offering a new e-course, Homeschooling ABCs, to guide new homeschoolers. As an 11-year homeschooling veteran and mom of six, Terri will bring confidence and guidance to new homeschoolers through 26 weekly lessons delivered right to a personal email box. Terri takes the overwhelming and breaks it down into short and manageable lessons, designed to get a new homeschool up and running within 48 hours with continued success. Lesson topics range from how to go about your first day, discovering learning style, where to find curricula, managing multiple ages and how to stay organized and sane all the while. The step-by-step approach to getting your homeschool started is non-threatening and Terri never makes you feel like you are behind. Most weekly lessons are about 5-10 pages of one topic, ending in a short assignment. Below you will find titles of the first 10 lessons. Copy the Classroom - Not! Helpful links and websites are included throughout, some of which I didn't learn about until I had been homeschooling for a couple of years. Not only does Terri include her words of wisdom, over $200 of bonus gifts from partnering companies are provided throughout the course. For example, in the lesson that discusses hands-on learning, two different science activity e-books from Hands of a Child are provided. Samplings of products, articles from experts, and various e-books will be available to you just when you need them. Each homeschooling family is unique and has their own way of homeschooling. This e-course is geared towards Christian homeschoolers, with a lean towards those with younger children, larger families, and a more relaxed and eclectic approach. Because Terri is sharing a glimpse into her own personal homeschool, not every approach she takes will apply to everyone. However, she will point those just starting out, or even experienced homeschoolers that are revisiting their approach or in need of some encouragement, in a direction and share some great resources that are useful to all. Knowing where to look and what questions to ask is a great beginning for anyone trying to establish a homeschool they can call their own. Just as a friend would sit down and give you their personal story with guidance, so does Terri. The only thing missing is the cup of coffee or tea. So grab your favorite warm drink and get ready to learn from the experiences of a veteran homeschooler. The Homeschool ABCs e-course costs $60, billed $10 monthly. This amounts to just $2.30 per lesson and comes with a 100% money-back guarantee. A free 5-day mini course titled Do You Want to Homeschool with Confidence? is available, with the first lesson arriving in your email box within moments, as an introduction to Terry's friendly teaching style. Visit the Official TOS Crew blog to hear what others thought of Homeschooling ABCs. Perhaps you've experienced the following scenario. You are correcting your child's latest math assignment when you have a startling discovery. While it appears that the new concept is understood, not applying previous material correctly is causing your child to get too many problems wrong. It may be a concept from years earlier that your child never mastered, or perhaps just forgot, or one that was not covered in depth. Either way, a sudden realization surfaces that you must go back to the basics or review. Your child needs extra work on a particular topic right now in order to continue. You are ready with your shovel to fill in that hole, but you need to find some mathematical dirt....quickly. Maria Miller, author of Math Mammoth, has the answer for all you shovel-holding, math-teaching parents and tutors. A math teacher and tutor turned homeschooler, Maria Miller noticed that often homeschooling moms struggle with teaching math. Through her tutoring experiences, she developed a desire to help struggling math teachers do a more effective job teaching their students. It was her hope to improve elementary math teaching to include more mathematical understanding rather than rule memorization. Furthermore, she had a goal to do all of this in an affordable, self-teaching and mastery-focused manner. Large goals, but I do believe she's met them. Math Mammoth has a full line of products for grades 1-8 to fill just about any need, whether it be a full curriculum, supplemental, or remedial resources. All products come in an easily downloaded format, perfect for those who are wanting to get started right away. There are several different series and collections available. Since my kids are already settled in with a main math curriculum, I selected supplementary titles for review. I received four different titles, Place Value 4 and Geometry 1 from the Blue Series for my son and Fractions and Ratio, Proportion & Percents from the Green Series for my daughter. At first, all I saw were a bunch of worksheets and wondered how they differed from any other worksheet. I fully expected my kids to approach doing math from more worksheets with their eyes-crossed. My son is great at math conceptually, but hates to write and often attempts mental math beyond his capability to do so. My daughter is convinced she stinks at math. Though she was an advanced math student in the early years, she's been in a holding pattern for a few years while both her development and attitude are ready for progression. I consider neither to have a preference for worksheets. I was very pleasantly surprised with how my kids took to Math Mammoth. My son is a little weak in place value yet was able to work through the worktext pretty much on his own. I used this as a supplement to his regular math program, which covered the same material but not as in depth, and usually had him do 2 pages in a sitting. The explanations were thorough and the problems incremental enough that he was fairly independent through-out the whole book. He's recently started the Geometry 1 and I can tell he is really going to enjoy this title since it is hands-on learning through drawing. The real shock took place with my math-phobic daughter. She actually liked doing the worksheets. While the Green series does not have much explanation, the problems built on each other in such a way she easily (re)learned the material. She also liked that there was just one book, not a separate text and workbook or problems to be copied to paper. For my daughter, Math Mammoth was an excellent tool for reviewing material and developing mastery. For two different kids with different learning styles and needs, Math Mammoth was a winner. Also to my surprise was that I liked the ebook format. At first I thought it would be a drag to have to print everything. Unlike other ebook products, you obviously have to print worksheets to use them. However, you need only print what you need. Another benefit is that you have Math Mammoth's permission to print as many copies needed for your whole family. When younger siblings move into the material, your only additional cost is for printing. The immediate delivery is a definite plus, especially when you are in a panic over the results of your child's latest math assignment. While there is much to be liked, there are two areas worth mentioning that may cause problems for some. For younger kids who still have large writing, there may not be enough space on the worksheet. I thought his might be an issue for my son, who is still working on pencil control, but it was easily eliminated. I printed the worktext in batches and placed the copies in a 3-ring binder. Whenever he needed extra space, he just used the available space on the backside of the previous page in the binder. The other issue is that I found more errors than I would care to see in the answer key and a couple in the actual text of one title in particular. If the answer appeared to be wrong based on the answer key, I was sure to work the problem myself before marking it incorrect. Having a math background, this wasn't much of an issue for me but may cause those weak in math some stress. Being this is a digital product, I do expect the author will be able to quickly revise any errors that are brought to her attention. Overall, Math Mammoth is an excellent product at an affordable price. The approach and explanations are clear, easily understood and thorough. The next time I have a mathematical hole to fill, Math Mammoth will be a definite source to stick my teaching shovel in. Be sure to check out the Math Mammoth website for more information and pricing options. Products are available in several formats from various sources. You can also sign up at the website for Maria's Math Teaching Emails and Newsletter and receive 280 worksheets and teaching article for free. Her Homeschool Math blog and her Homeschoolmath.net website also have a ton of resources for you to "dig in". See what other Crew members thought of Math Mammoth as a supplemental source or a complete curriculum by visiting the Official TOS Crew blog. For a short time, I would speak Pig Latin when discussing with my husband a topic that I wanted to keep from little ears. It was a short-lived strategy because my preschooler soon become more fluent in Pig Latin than my husband. Idskay areway ickquay. Not only are most kids curious about language, they pick it up very easily. I've always been a bit jealous of those households that were bilingual and the children had the benefit of learning two languages with ease. Unfortunately, with the exception of said Pig Latin, English is the only fluent language in our household. My practical foreign language expertise is limited to a year of junior high Spanish - many, many years ago. I retained enough to teach my daughter how to count to ten in Spanish when she became very interested in learning a new language, but Dora the Explorer would have been a better teacher. Maybe I can get my kids, now 9 and 12, to watch Dora? Thankfully, Spanish in 10 Minutes a Day arrived for review before further consideration of PBS morning programming as a serious foreign language learning tool. My review package included a 132-page workbook with supplemental CD-Rom and an audio CD set. Expert linguist Kristine Kershul is the author of the 10 Minutes in a Day series by Bilingual Books, an established foreign language program of over 28 years. After years of teaching in the classroom, Kershul recognized that most students studying a foreign language were doing so for personal enrichment, a goal often unmet with a strictly academic approach. Bilingual Books' building-block approach, achieving results quickly, was created for language learners studying for their own enjoyment or travel. The short and fun lessons introduce vocabulary in bite-sized pieces to be learned at your own pace. For more explanation of the method, you can listen to Kristine Kershul explain the playful step-by-step approach taken in the series. Each workbook comes complete with a CD-Rom, 150 sticky labels and flash cards. The colorful workbook pages start out with seven key question words: where, what, who, why, when, how, how much. Throughout the workbook, simple phonetics are included above the words so there is no guessing on pronunciation. The key question words are built upon with vocabulary needed to ask basic questions if you were to travel to a Spanish-speaking area. The focus is on words commonly used in everyday life, quickly getting the learner up to a functional speaking level. Spanish culture and customs are also introduced. You can view the 25 steps covered in the workbook here. The sticky labels are to label household items for further practice and immersion. The flash cards help practice vocabulary away from home. If you are learning a new language in preparation for a mission trips or overseas travel, the flash cards can easily be brought along to use while traveling. The interactive CD-Rom contains matching games of common words with instant feedback (see right). The audio set contains six CDs covering the material in the workbook with nearly 8 hours of instruction. Fifteen different Spanish speakers deliver the lessons for the student to hear and copy proper pronunciation. The audio set can be used independently or as a supplement to the workbook. You can listen to one of the beginning lessons and learn the Seven Key Question Words for Spanish here. You may also want to listen to the following lesson to get an idea of how the material is reviewed and practiced in the program. To see how the audio CDs coordinate with the workbook, you can print the workbook pages that go along with the two audio lessons above here. This is truly a low-pressure and fun approach to learning a new language. While designed for adults, the workbook is simple enough to be completed by elementary children. Non-readers and young children can join in using the audio CDs and learn along with the rest of the family. I have two very different learners in our household. My daughter is very language arts oriented and I utilized both the workbook and audio CDs, so she could both see and hear the language. My son is dyslexic and I mostly focused on learning through the CDs for him because I did not want to complicate the phonics and spelling remediation we are doing with him. He enjoyed listening and practicing new words with my daughter while keeping his hands busy with Legos. Regardless of what type of learner you have, I would highly recommend purchasing the audio set to complement the workbook. The reinforcement of hearing the words spoken can only aid and strengthen the use of a new language. We found them a helpful tool for easy review in the car as well. While Bilingual Books can be a useful tool for students wanting to explore a new language, I would not consider it comprehensive enough for use for a high school foreign language credit. However, it would be excellent to spark or satisfy an interest in a new language, to prepare for a family or mission trip to another country, or to introduce a language as the first step of further study. The design is to quickly learn a new language for immediate use. The teaching parent does not need to have any previous knowledge of the language. If your child is interested in learning Japanese, Hebrew, Chinese or one of the 16 available languages, Bilingual Books is a fun way to quickly try out and explore the language. Keep in mind that the original target audience for this program is adult travelers. Parents should be aware that one of the first things taught in the program is how to ask for a glass of wine! The menu section also contains a selection of alcoholic beverages. Obviously this is appropriate for the adult traveler, but you may not want your 10-year-old learning how to order a beer and should modify accordingly. While some phrases wouldn't be something a child would need, e.g. asking for certain beverages or learning how to pay the restaurant bill, overall the program is quite adaptable to homeschooler users wanting to experience a new language. Can you really learn a new language in just 10 minutes a day? Si! With some practice, you and your children can be speaking Espanol in no time. Visit Bilingual Books to view products for the 16 languages offered. “Cuanto cuesta (how much does it cost),”, you ask? Workbooks with the CD-Rom, offered in all languages, are available for a list price of $24.95. 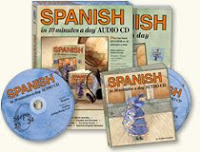 The audio CD, available for Spanish, French, Italian and German, has a list price of $42.95. You may purchase both the workbook only and audio CDs as a package, which lists for $59.95. Also available are language maps, a convenient list of important words and phrases, for $7.95. Furthermore, Bilingual Books offers a 25% discount for all prepaid orders placed by homeschoolers, making this program even more affordable. You will not find this discount on the website yet and will need to call to receive it. You may also find products by Bilingual Books in many stores and popular online sources. Be sure to check out what other Crew members thought of Bilingual Books by clicking here. Select a card from each category. Write a story using the ideas in the cards, writing for as long as you like. It was a pretty open ended assignment, but I didn't want to put a lot of requirements on him. I just wanted him to practice writing in a way that wasn't threatening. He originally selected the following cards: detective, clever, a strange telephone call and secret room. Before he even started writing, he decided to select several more cards from each category and then eventually grabbed the whole character pile and headed to the computer. Below are the results, with punctuation and spelling only corrected for readability. I wonder what will happen next? If you would like to know the ending to this story, feel free to leave an encouraging comment to be forward to the author! Hello, my name is John. My story begins one day as I was sitting on my couch when I got a mysterious phone call. It was the state police! They said they needed me in England. Some of the Queen’s jewels had been stolen! Knowing the stories of Sherlock Holmes, I dashed out the door to the airport and got the last plane ticket to England. Ten hours later, I got off the airplane. The Queen’s palace guards took me to the palace. There I met the Queen herself! After they led me to my private chamber, the next day the Queen told me what had happened. Randomly select one card from each category. You will write about the events leading up to the situation described by the cards. First, plan what you'll write for 5 minutes. Next, write for 15 minutes only. Her selected cards were: explorer, fearless, a strange disease and mansion. Below are the results. I'd love to read more and find out how this story turns out. If you would too, feel free to leave an encouraging comment to be forwarded to the author! *woof* I tumbled down from the rope again. I had been practicing swinging from vine to vine so I could go on a trip with my grandfather to Africa. One of my grandfather’s many friends had a strange disease that could not be cured. However, it was rumored that deep in the jungle, where great cats and bugs roamed, a flower stood in the middle of the jungle that could cure any disease, no matter what it was. There was one catch though, the flower only worked if it was picked when it was blooming. And it only bloomed once every 20 years, in the month of June. The last recorded blooming had been in 1905, and since it was now the beginning of June, it should bloom in about 2 weeks. “Joshua,” I heard my grandfather call, “meet me in the parlor!” I dashed out the door of the training room and through the rest of the mansion. Racing up the steps, I buttoned on my jacket and ran my fingers through my hair. I knocked on the parlor door twice and then entered. “Yes, Grandfather? You wanted me?” I looked around the parlor. My grandfather, wrinkled but looking young, and with a twinkle in his eyes, was sitting in his favorite red chair, the one that was big and soft and overwhelmed you when you sat in it. In the chair next to him, sat a stranger, someone I did not know. Who was this man? “Joshua, I’d like you to meet Mr. Cunningly, the friend we are going to the jungle for.” I backed up a couple steps, hoping the disease wasn’t catching. My two children have vastly different writing styles. My daughter never has a shortage of ideas. Her writing is fast and furious, though taking a story to completion doesn't always happen. However, her half-written novels flow on paper with ease. Giving my daughter an assignment deadline is usually motivation to finish her already started independent work. My son, however, is often troubled when asked to select a writing topic. Giving him a blank piece of paper with no topic creates a panicked look across his face. A deadline for a completed project will produce nothing but writer's block. Ideas come slowly and he may dwell on a story idea for months, formulating a plot in his head. This fall he asked me to help him type out a story that he had been composing mentally since June! My son carefully develops his story over time and struggles to get those wonderful thoughts on paper. My daughter writes with ease, composing and typing simultaneously. While different styles usually call for different resources, I was pleased to find a versatile writing tool in Writeshop's StoryBuilders. I received the World of People and the Christmas Mini-Builder card sets from WriteShop for review. Each card set, in the form of an ebook, includes printable cards of story elements in the categories of character, character trait/emotion, setting and plot. While I typically don't care for digital products, this format was well-suited in this case. The product consists of a few pages of instructions accompanied by a set of 192 cards (96 for Mini-Builder sets), printable in either in black or colored text. Forty-eight blank cards are also provided for adding to the categories. It is recommended that printing be done on cardstock for durability. If you don't have colored cardstock available, a different color for each category, the cards can be printed with colored text on white cardstock or regular paper. I highly recommended purchasing a multi-colored pack of cardstock, available for around $3.50 a pack at discount stores. One pack of card stock can be used for more than one StoryBuilder card set. Several ideas are provided with each set, but there is no right or wrong way to use the cards. One card from each story element category should be selected. Selections can be random, decided by the student, or picked by chance with a roll of a die (e.i. rolling a number 4 means you get the forth card in the pile). Independent students can simply use the cards to start formulating a story surrounding their selections. For the more reluctant writer, a timer could be set for just a few minutes, adding to the story each day. The cards could also be used Round Robin style in a group setting, giving each student a set of cards to start a story and then pass the story to others to add on. By drawing more cards from the piles, more characters and events can be introduced into the story line. I decided to first try these out with my reluctant writer. To be honest, my son was more than a little suspicious. I took six cards from each category, gave him a die, and had him roll for each category. He reluctantly took his cards, strung them together and composed one sentence, “The clever burglar was on a raft with his feet and hands tied.” I started asking him questions. I then took four more cards, one from each pile, and added to his one-sentence story. “Along came a fearless postal worker who was lost in the jungle and saw the burglar floating on the river..."
At that point, my son started jumping in with his additions and before you knew it our burglar had met some interesting characters and events, including having his head stuck in the mud by a baby. My daughter soon jumped in and both kids were roaring with laughter at their silly story. Now that the intimidation was gone, I had my son go through the cards and select one card from each pile for a story development. He chose the following cards: detective, clever, a strange telephone call and secret room. Interesting. Once the potential of his choices started to develop, he decided to select several other cards for twists and turns in the story. He happily trotted to the computer with his pile of cards to create his story. A title was pecked out, followed by "Chapter 1: The Mysterious Phone Call". The ideas were flowing. My reluctant writer was formulating a story that didn't take months of mental composing. You can read the beginnings of his story here. I don't often give assigned topics for my daughter, but they are a great exercise to occasionally use in preparation to quickly formulate a written response based on given parameters. The writing portion of the ACT and SAT and essay questions on exams, for example, would require this skill. However, receptiveness from my daughter to being told what to write about is non-existent. Her approach to her writing is like that of an artist, and rightly so. She's a talented and creative writer. Even though she wasn't thrilled about an assigned writing topic using the cards, the results made it worthwhile. I had her randomly select one card from each category and asked her to write for 15 minutes only. Given she often doesn't finish stories, the assignment was to write a story that explained the events that led up to the situation in the cards, which would act as her concluding event. Her selected cards were: explorer, fearless, a strange disease and mansion. You can read what she came up with here. I suspect she may sneak a peek at these cards again later, as long as it is on her own terms. On occasion she does have writer's block, and she mentioned the cards might help with character development. Anything that both inspires a non-writer to write and serves as a tool for talented writers is a winner to me. 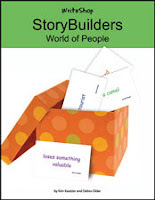 StoryBuilder card decks are a wonderful creative writing tool that provide a jumpstart to the imagination and inject a little fun and variety in writing exercises. Students of all ages, either independently or in groups, will be inspired, and even humored, by the sparks of ideas resulting from use of StoryBuilders. Aside from writing assignments, these simple little card decks have lots of potential. Parents can use them to come up with bedtime stories, families can build stories together during long car rides, and groups can utilize them for team writing exercises. The endless card combinations will create new story ideas each time you use a StoryBuilders set. Four StoryBuilder sets, World of People, World of Sports, World of Animals and Christmas Mini-Builder, are currently available for immediate download. A new title, World of Imagination, will be released soon. Prices range from $3.95-$7.95. Be sure to visit the WriteShop website and browse the other products available. Read how other TOS Crew members used StoryBuilders in their homes here.